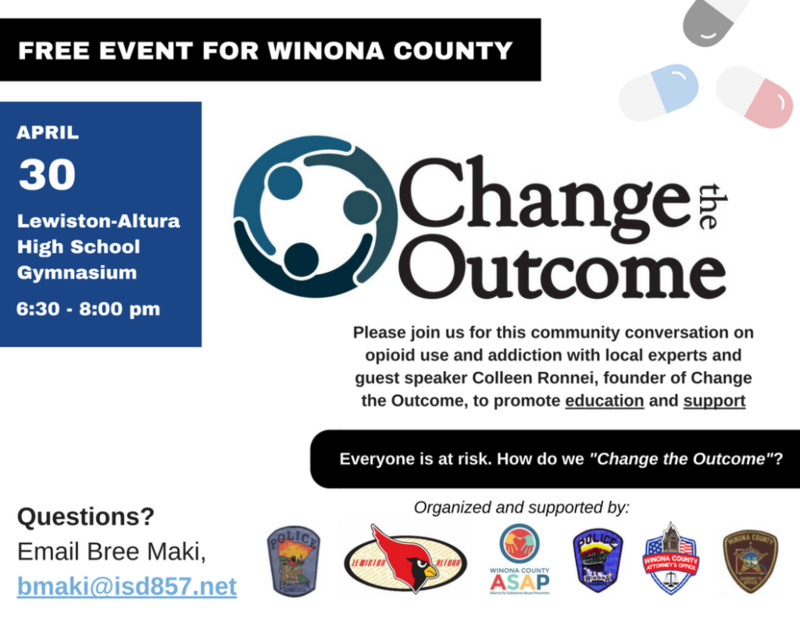 The Lewiston-Altura School District is hosting a free community event to provide education and support about opioid use and addiction. In light of the national opioid epidemic and increasing overdose deaths each year, organizers are partnering with local experts and guest presenters to prevent opioid misuse. “The percentage of students in Winona County who report using a prescription pain killer not prescribed to them is slightly higher the national average, so this information needs to be heard by students and adults” (Phil Huerta, Winona County ASAP Program Coordinator). The free event will take place on Monday, April 30, 2018 from 6:30 pm – 8:00 pm in the Lewiston-Altura High School Gymnasium. Special guest Colleen Ronnei, Founder of Change the Outcome, will join the panel to share her family’s personal story of how they lost their son to an overdose and her efforts to make something good from her heartbreak. Change the Outcome, a non-profit organization, will present information and testimonials alongside people in recovery, local law enforcement, healthcare, and resource agencies. You can email Bree Maki at [email protected] with any questions. Two FREE training workshops are being provided by the Winona County Alliance for Substance Abuse Prevention (ASAP) for all professions and community members. CEU’s or contact hours are available at no cost. Intercultural development consists of bridging cultural differences and commonalities by building specific knowledge and skills. Come explore how to develop your capacity to effectively bridge cultural differences and commonalities, and discuss how this might inform your work for a healthier community. Get shared meaning on commonly used terms like: diversity, inclusion, culture and intercultural competence. Explore how we develop the capacity to bridge cultural differences and commonalities. Begin to become more aware of how our cultural identities shape how we see and experience our work. Do you spend much of your time listening to and helping others? If so, how are you taking care of yourself so that you can take care of others? Come build and deepen ways to cultivate your own balance, health, and wholeness. Discuss resilience and its importance to the practice of leadership. Reflect on the resources we can draw from to build our own resilience. Sara Schonwald is a dynamic facilitator, trainer, listener and coach. Her practice of leadership and consulting centers the belief that we’re all connected to each other, and that it is our collective opportunity and responsibility to work together for justice and peace. Sara is a Qualified Administrator of the Intercultural Development Inventory and a trained practitioner of the Myers Briggs Type Indicator (MBTI) and Art of Hosting. She earned her B.A. in Psychology from George Washington University and M.A.Ed. in Policy, Organization, and Leadership Studies from Stanford University. We are hosting our 2nd Annual Appreciation Event to say “Thank you” to all the volunteers who helped in any way! In addition, we will be recognizing 3 Prevention Champions in the community who made a significant impact to reduce and prevent teen substance abuse through their volunteerism and influence in Winona County! ASAP will also be releasing its 2017 Annual Report and highlighting ways you can help make a difference. The event is being sponsored by Minnesota Adult & Teen Challenge, and is open and free to the public. Light appetizers and refreshments will be provided. Please come to join in the celebration and learn more! PLEASE REGISTER TO HELP US PLAN FOOD AND DRINK ACCORDINGLY. Hidden in Plain Sight (HIPS) is a free exhibit we offer to parents and guardians to learn about the warning signs of experimental and regular substance use. 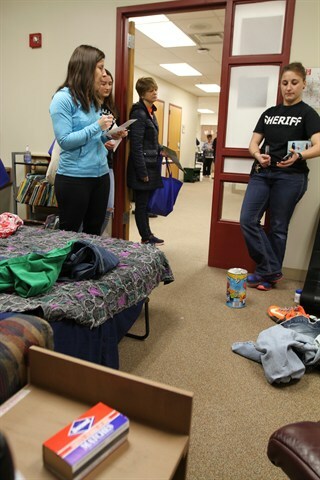 Adults are only allowed to walk through this mock teen bedroom with a checklist to try and identify more than 20 household items that may indicate substance use. The next opportunity to view this exhibit will take place at the Way to Wellness Expo. You can view and print the flyer below. To request a showing of the exhibit with your group or organization, please email [email protected] or call 507-474-2727. July 18, 2017: Watch KTTC Rochester news to see the event at Winona Health. July 12-16, 2017: Read about our time at the Winona County Fair in this Winona Daily News article. February 28, 2017: Read this Winona Post article to learn more about the event at the “Way to Wellness” Expo.